Pungoteague River Lighthouse was built in 1854 just offshore near the entrance to the Pungoteague Creek in Accomack County, Virginia. It was the first screwpile built in the Chesapeake Bay and was built by Major Bache. It was constructed on seven pneumatic piles and was equipped with a fifth order lens. The lighthouse was overturned by ice flows on February 2, 1856. It had the shortest recorded existence on the Bay, 459 days. In 1908 a flashing light on a concrete filled caisson was installed on the existing foundation. 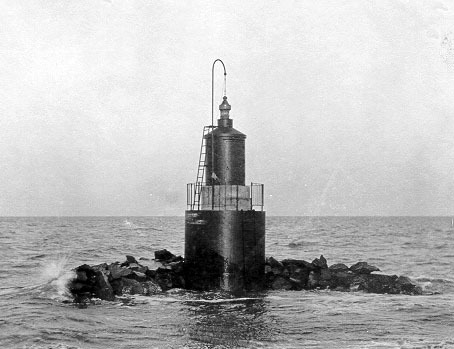 Between 1856 and 1908 there was a privately maintained beacon. As a result of the destruction of Pungoteague River lighthouse, efforts were made to further protect future screwpiles with additional riprap.